Tired of the kids writing on the walls? Our House and Tree peel and stick chalkboard lets them do it with your blessing! 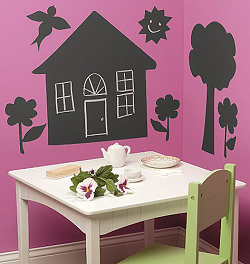 Simply peel and stick these vinyl House and Tree chalkboard wall decals to any dry, clean, smooth surface, and presto! Instant writing surface! 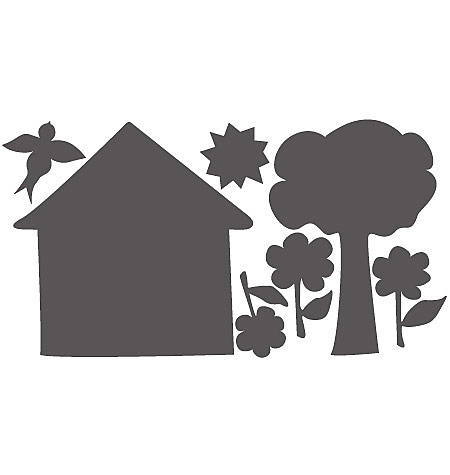 In fun shapes, including house, tree, flowers, bird, and sun, these Wallies House and Tree peel and stick chalkboards are removable and repositionable, just awaiting your budding artist. House 20.25" x 19.75"; Tree 14.25" x 19.875"; Sun 6" x 5.625"; Flowers 5.25" x 7.5" to 5.75" x 9"; Bird 7" x 7"